Preparing for an Objective Structured Clinical Examination (OSCE) is very different from preparing for a theoretical knowledge examination - your clinical skills and performance will be tested rather than just your knowledge of the theory. 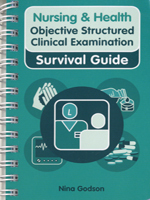 It is important to understand how to achieve the best results in an OSCE, and this handy pocket-sized guide describes each clinical skill in turn to help you feel confident and prepared for the exam. What is an Objective Structured Clinical Examination?